Congratulations to Pacific Ridge student-athletes JoJo Biddle and Stephanie Stone, who signed National Letters of Intent (NLI) last week. 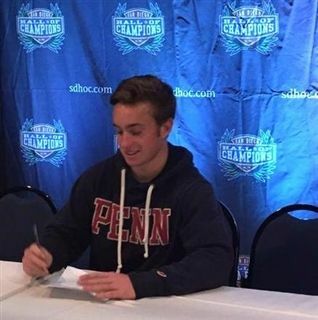 JoJo has committed to continuing his lacrosse career at the University of Pennsylvania, where he will join a Division I Quaker squad looking to compete for the Ivy League Championship and return to the NCAA Tournament. Stephanie is looking forward to continuing her volleyball career at Marist College, where the Division I Red Foxes have earned a trip to the Metro Atlantic Athletic Conference Championship for the past two seasons and are looking to add a third during this weekend's postseason tournament.